Usually when a home is built to take advantage of the sun for energy, it features solar panels and energy systems. 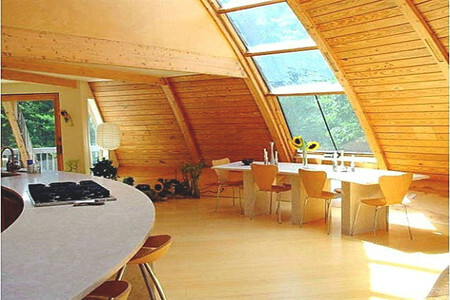 But in one dome-shaped home in New Paltz, New York, solar power is harnessed through a rotating feature much like the earth, except it comes with a remote control. 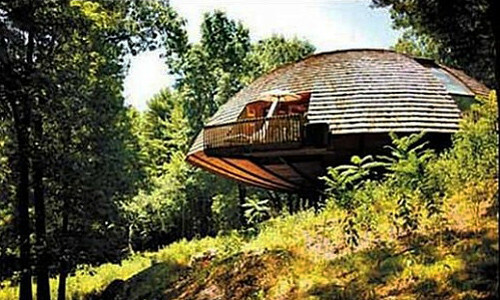 Dubbed Domespace, this 3,000-square-foot circular home is built on an electronically-controlled axis with the ability to rotate 360 degrees in just five minutes. 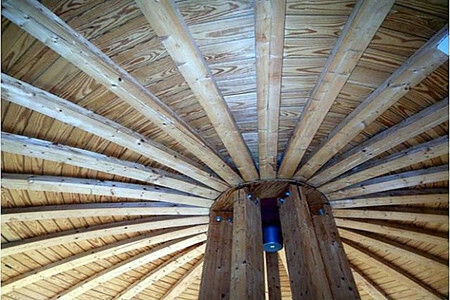 The circular design is modeled after other eco-friendly homes such as huts and igloos. While the home doesn’t always have to be spinning, it does rotate each season to take advantage of the sun for all of its solar energy needs. Located only 90 minutes north of New York City, and in walking distance from the Mohonk Preserve, this attractive property is listed at $1.2 million. But the rotation feature isn’t the only advantage that makes Domespace so appealing. This contemporary two-story home is eco-friendly and extremely comfortable. It features stylish bamboo floors, beautiful wood and stone cabinets, spacious rooms with 40-foot ceilings, and a central spiral staircase. It has three bedrooms, and two and a half baths. The second floor features the master bedroom, an office, and a balcony. The listing agent of the home, Anne Rajs, says it looks like a space ship. and that it is the “coolest home” she’s ever seen. Although it is definitely one-of-a-kind in the U.S., this eco-friendly beauty was built using a kit from France. According to the French manufacturer, Domespace, there are nearly 200 of these homes built in France and abroad, including Switzerland, Germany, Spain, and Taiwan. The new owners can enjoy living in an eco-friendly home with the ability to walk to the preserve, which holds 1,000 acres of hiking and rock climbing. At only $ 1.2 million, your new address can be 116 Canaan Rd, New Paltz, New York, 12561.